Holyrood has been “spurned” and its power “eroded” in the past two years, when Scotland was taken out of the European Union “against our will”, Ms Sturgeon said. In a blistering attack to No10, the First Minister said the Brexit referendum and the following negotiations with the EU27 helped the case of those favouring an independent Scotland. Ms Sturgeon told BBC Good Morning Scotland: "Everything that has happened over the past couple of years, from Scotland facing exit from the EU against our will to every reasonable attempt at compromise to protect Scotland's interests by the Scottish Government being spurned, to the powers of the Scottish Parliament being eroded, to the UK Government even taking the Scottish Government to court, all of that has strengthened and reinforced the case for Scotland to be independent, because these are not just academic arguments, all of this will have a material impact on Scotland's economy and well-being for decades to come. Ms Sturgeon said the outcome of the EU Referendum deprived those calling for a united UK of a major argument. She continued: "We were told in 2014 that it was voting for independence that would put in peril our membership of the European Union. Ms Sturgeon revealed there is a mandate to hold an independence referendum before the end of term of the current Holyrood parliament, May 6 2021. But, she said, a second vote on Scotland’s independence won’t take place until the UK is officially out of the bloc. Scottish people answered the question “Should Scotland be an independent country?" in the referendum held on September 18 2014. The 'No' side won 55.30 percent against 44.70 percent. Despite Ms Sturgeon’s determination to hold a second independence referendum, Scotland’s Labour leader Richard Leonard said there is no appetite among Scottish people for another vote. “A union that has been in place for 300 years would, in my view, cause considerable economic disruption and there is no appetite from the people of Scotland for it. 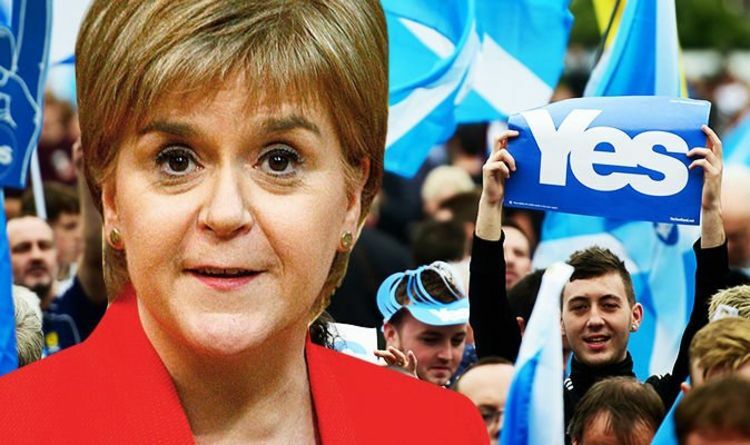 Ms Sturgeon’s words sparked outrage among the Liberal Democrats, with the Scottish party leader Willie Rennie saying: “The nationalists appear to have learned absolutely nothing from Brexit. And Pamela Nash, chief executive of Scotland in Union, accused the First Minister of trying to "weaponise Brexit". She said: "Nicola Sturgeon couldn't be more wrong. "Brexit has weakened the case for independence, not strengthened it. “The process has proved how incredibly difficult it is to leave a union between nations.